This month we celebrate something that you can’t see or hold but which is real all the same. What is it? An idea! Ideas are amazing things. Sometimes seemingly conjured up out of thin air and sometimes the “Eureka!” result of long, hard work, ideas fuel our arts, sciences, education, and home life. So today, write down those ideas you have while driving or commuting to work, while in the shower, when you’re daydreaming, or just as you turn off the light to go to sleep. You never know what they might become! Tundra Books sent me a copy of The Magician’s Secret to check out. All opinions are my own. When Mom and Dad dropped Charlie off at his grandfather’s for an overnight visit, they pleaded with him to make sure his grandson went to bed early. “‘No more hocus-pocus!’” his daughter said. That wasn’t just some phrase she conjured up, because her father had once been a magician and was still “like a big kid who never grew up.” He loved to play games with Charlie and “also knew the most amazing tricks.” But he never told Charlie his secrets. Copyright Joe Bluhm, 2018, courtesy of joebluhm.com. What Charlie loved best were Grandpa’s stories. Whenever Grandpa told a story, he and Charlie went up to the “most cobwebby corner of the attic” where a big green trunk full of special things from Grandpa’s adventures sat. Grandpa would pull out an item and begin to talk. This night he showed Charlie an hourglass filled with sand that Grandpa said came from the tomb of King Tut. Another time, he pulled out a scarf that had belonged to the World War I Red Baron fighter pilot. Grandpa had plucked it from the Red Baron’s neck during a dogfight in which Grandpa left the Baron and his plane floating in a French sea. One summer evening the story revolved around a coconut shell that he found on a tropical beach. He had fallen asleep under a palm tree only to be awakened by a roaring T-Rex intent on eating him. Just in the nick of time, “dozens of rocks rained down through the air, scaring the nasty dinosaur away.” Who had saved him? Grandpa never told, saying that was for Charlie to figure out. Charlie wasn’t so sure, but Grandpa assured him: “‘We’ve done it over and over again, with cameras and computers, automobiles and airplanes…. Magic is all around us, kiddo—in me and in you.’” Then Grandpa waved his hands in the air and produced a…rock. He said it was the philosopher’s stone that could do magical things, but the secret was that “‘You have to see it, you have to believe it.’” That night Charlie fell into a deep sleep with the rock under his pillow. When he woke up, he heard an earth-shattering roar. He looked and saw a T-Rex threatening his grandpa. He looked at the rock in his hand and knew what to do…. Zachary Hyman makes magic with traditional storytelling combined with the wonder of imagination and the encouragement to make dreams come true. As Grandpa talks about his daring feats, Charlie believes him, but more importantly, Charlie believes that he could do such marvelous things too. Hyman’s reminder that all great discoveries and achievements began as someone’s seemingly impossible idea is well aimed at his young audience whose boundless imaginations may just be our next realities. Hyman’s evocative language and conversational tone will keep children enthralled until the surprise ending. Joe Bluhm lends a mysterious enchantment to Hyman’s story with his atmospheric depictions of the cobwebby attic, darkened, creature-infested tomb, and twilit skies. Turning from the setup to the heart of Grandpa’s stories, readers are immersed in vibrant colors and dazzling light, representative of that flash of ingenuity or creativity in each of us. In a nice cyclical set of images, Charlie is first seen watching TV and playing aviator, spaceman, explorer, artists, and magician with Grandpa in sepia-toned snapshots. Near the end of the book when Grandpa talks about the power of imagination, these same scenes are presented in full color with Charlie as a pilot, astronaut, movie director, mountain climber, race car driver, and explorer. Like the best magic trick, The Magician’s Secret will captivate readers but will also tell them what they really want to know: the answer to how they can do wondrous things themselves. The book would make a terrific addition to home, classroom, and school libraries. To learn more about Joe Bluhm, his books, and his art, visit his website. It’s no secret that you’ll love this The Magician’s Secret book trailer! Do you sometimes have a lightbulb moment when an idea seems just right? 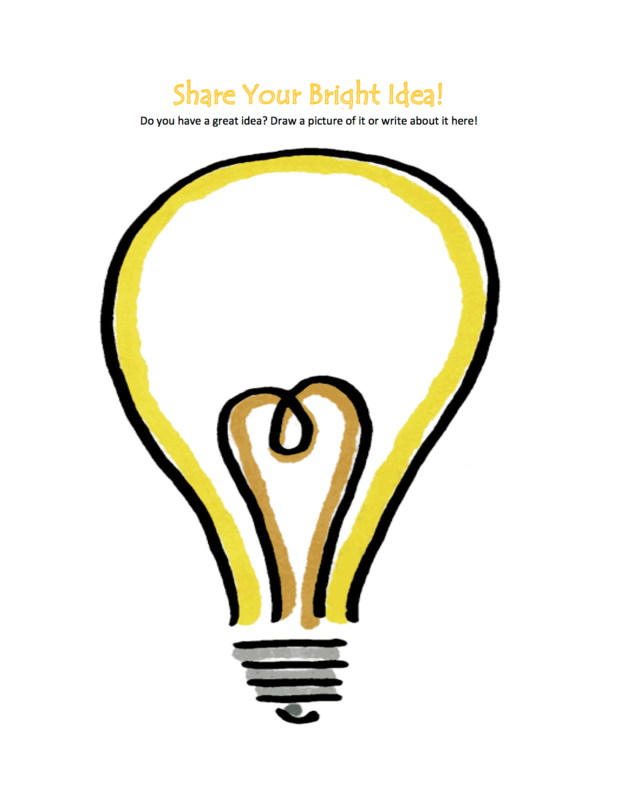 Use this printable Share Your Bright Idea! Page to write about or draw your idea! If you like to take a break from the routine or pressures of the work day and sew, garden, or read, play music, dance, or draw, or if you’ve always wanted to learn a new skill or develop a talent, then this month is for you! During National Hobby Month take some time to research a skill, art, or discipline that strikes your fancy and get started! Image copyright G. Brian Karas, 2016, text copyright Michelle Edwards, 2016. Courtesy of Schwartz & Wade. Holding the needles, Sophia thinks about what she was taught. Even though she drops stitches, she continues to knit. “She wants to make Mrs. Goldman the most special hat in the world.” The next day snow falls on Mrs. Goldman’s head as they walk Fifi. Sophia frets, and at home she begins knitting morning, noon, and night to finish her hat. Winter has set in and one day when the pair walk Fifi, “Mrs. Goldman wraps Mr. Goldman’s scarf around her head like she’s a mummy.” But the wind grabs it and rips it away. Sophia catches it, but shivers at the thought of how cold Mrs. Goldman must be. At home Sophia knits in a frenzy, adding row after row of stitches until the hat is finished. When Sophia looks at it, though, she finds holes where they shouldn’t be and lumpy and bumpy areas. She thinks what she has made looks more like a monster than a hat. Sophia takes out the box containing all the hats Mrs. Goldman has made for her, but they are much too small for Mrs. Goldman to wear. While Sophia’s mama and papa have hats made by Mrs. Goldman, she knows she can’t give those away. Michelle Edwards’ heartwarming story of a little girl who sees that her friend is in need and determines to help draws on children’s natural generosity and shows readers that their efforts are recognized and appreciated. Edward’s gentle and well-paced storytelling allows readers to understand the events and thoughts that bring Sophia to once again attempt knitting. Sophia’s solution to use the pom-poms she knows she makes well (and with love) to cover the holes demonstrates not only the ingenious creativity of kids, but also the idea that love can fill the voids in life. Brian Karas imbues the story of Sophia and Mrs. Goldman with a magical wonder that floats from page to page like the fluffy snowflakes that are the catalyst for Sophia’s mitzvah. A combination of full-page illustrations and snapshot images show days spent with Mrs. Goldman as well as the moments, hours, and days that adorable Sophia spends knitting her special hat. Sophia, tongue sticking out in determination, wields her knitting needs; she ponders her holey hat while imagining a frightened Fifi; and scraps of red yarn dot the floor and even sit atop Sophia’s head as she creates pom-pom after pom-pom. When Mrs. Goldman pulls the hat over her own head, kids will feel cheered, while adults may feel a small lump in their throat. A Hat for Mrs. Goldman is a gem. Its tender portrayal of kindness, love, and close personal relationships makes it an outstanding choice for any child’s home library. Discover more about Michelle Edwards and her books, plus activities, recipes, and information on knitting on her website! Enter a gallery of books, sketches, blog essays, and more by G. Brian Karas on his website! These kids have all lost their hats! Can you follow the paths in this printable Winter Hat Match Puzzle to reunite each child with the right hat? Baking soda is one of those little chemical compounds that is indispensable in so many ways. First produced in 1791 by French chemist Nicolas Leblanc, it’s used for everything from cleaning solutions to health remedies to black snake fireworks to science fair volcanoes. In 1846 two New York bakers, John Dwight and Austin Church, established the first factory in the United States to produce baking soda from sodium carbonate and carbon dioxide. Of course, baking soda is also used to make treats of all kinds – even the ones featured in today’s book! Three little cubs bundle up in their winter coats, hats, scarves, and mittens and head out over the snowy hills to Grandma’s for baking day. Soon they see “past the pond so smooth and clear / little cottage drawing near.” A knock on Grandma’s door brings her closer, and when she opens the door the trio give her a kiss before entering the snug home. Anika Denise’s sweet, rhyming story is as heartwarming as a cozy kitchen on a cold day. The buoyant rhythm is a joy to read, and Denise’s infectious repeated verse, “It’s baking day! / It’s baking day! / It’s baking day! / at Grandma’s!” invites little ones to join in the story. The bond between the three cubs and their grandma is full of love and hugs, and just like the young bears, readers will want to return again and again to Grandma’s house. Christopher Denise infuses his winter landscapes and Grandma’s house with rich, warm colors that welcome readers into this special family baking day. The three cubs, wrapped in green coats and red knit caps, march with their sled over brilliant white snowy hills between their house and Grandma’s tidy log cabin. Inside, the rooms glow with golden sunshine, and it’s easy to see why the cubs love their attentive grandma so as she gently guides them in baking. Newly available as a board book, Baking Day at Grandma’s is a book that young children will love to hear over and over at story time, naptime, or bedtime. It would also make an appreciated gift to or from a grandmother. Learn more about Anika Denise and her books and find Reader Engagement and Activity Kits on her website! Discover the illustrated world of Christopher Denise on his website! Spend time baking with Grandma with this sweet book trailer! This delicious vanilla cupcake recipe from Sally’s Baking Addiction would definitely please Grandma—and they’ll become your favorite confection too! Preheat oven to 350F degrees. Line muffin tin with 12 cupcake liners. Set aside. In a medium bowl, mix together flour, baking powder, baking soda, and salt. Set aside. In a large microwave-safe bowl, melt butter in the microwave. Whisk in sugar – mixture will be gritty. Whisk in egg whites, yogurt, milk, and vanilla extract until combined. Split 1 vanilla bean down the middle lengthwise. Scrape seeds from half of the vanilla bean into batter. Reserve other half. Slowly mix dry ingredients into the wet ingredients until no lumps remain. Batter will be thick. Divide batter among 12 cupcake liners (or 24 mini) and bake for 20 minutes or until a toothpick inserted in the center comes out clean. Bake for 8-9 minutes if making mini cupcakes. Allow to cool. To make the frosting, beat softened butter on medium speed with an electric or stand mixer. Beat for about 3 minutes until smooth and creamy. Add confectioners’ sugar, cream, vanilla extract, and vanilla bean seeds with the mixer running. Increase to high speed and beat for 3 minutes. Add more powdered sugar if frosting is too thin or more cream if mixture is too thick. Add salt if frosting is too sweet (1/4 teaspoon). Frost cooled cupcakes (I used Wilton 1M piping tip). There may be leftover frosting depending how much you use on each cupcake. Store cupcakes in an airtight container at room temperature for up to 3 days and in the refrigerator up to 7. If you can’t get your hands on vanilla beans, add an extra ½ teaspoon of pure vanilla extract instead. Strongly urged to use heavy cream. You may use milk or half-and-half, but heavy cream will give the frosting a thicker texture. I recommend it! For ways to adapt this recipe and more scrumptious recipes, visit Sally’s Baking Addiction. I guarantee you’ll go back again and again! As families gather for holidays this month, National Roots Day encourages people to talk about their collective histories, look at old photographs, and tell family stories. Sharing laughs, traditions, and those “remember when…?” stories with children helps give them a sense of connection and belonging and ensures that important events, customs, and relationships aren’t lost to time. Copyright Angela Dominguez, 2017, courtesy of us.macmillan.com. Angela Dominguez pairs her heartwarming text with images that are at once simple and complex as they hold images that span the generations while also bringing them together. As Abuelo arrives as his daughter’s house, his grandchildren greet him enthusiastically with signs and balloons. The children are excited to see Abuelo get out his guitar, and as he sings, readers see that each child is comforted in different ways by their interactions with their grandfather. A sepia-hued portrait on the wall of Abuelo as a young man as well as clothing choices offer color-coded clues to Abuelo’s history and reassurance for events in the lives of his grandkids. As Abuelo reveals the restorative power of singing, Dominguez portrays examples of three situations on a tri-paneled page. The top, sepia-colored image depicts a boy sick in bed as a worried mother looks on; the second image is rose-colored and shows a single teddy bear; and in the aqua-toned third, a boy sits forlornly on the sidelines of an American football game. Copyright Angela Dominguez, 2017, courtesy of angeladominguezstudio.com. Turning the page, these three panels are more fully developed, letting young readers experience each characters’ disappointment in events that will resonate with them. Turn the page again, and children see that Abuelo’s assurance of brighter days comes true for all. Abuelo’s positive outlook is further revealed in cherished framed photographs, and the final image of the whole family gathered around Abuelo and his guitar is joyful. An Author’s Note includes the lyrics from Cielito lindo that inspired the story as well as a brief biography of Angela Dominguez’s grandfather, Apolinar Navarrete Diaz, that provides a deeper understanding of the story and the significance of Abuelo’s guitar. An inspiring and uplifting story, Sing, Don’t Cry would be a welcome read for those times when encouragement is needed both at home and in a classroom setting. 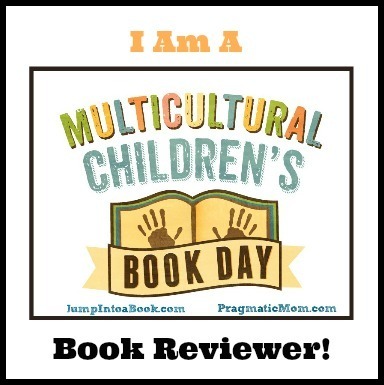 Learn more about Angela Dominguez, her books, and her art on her website. 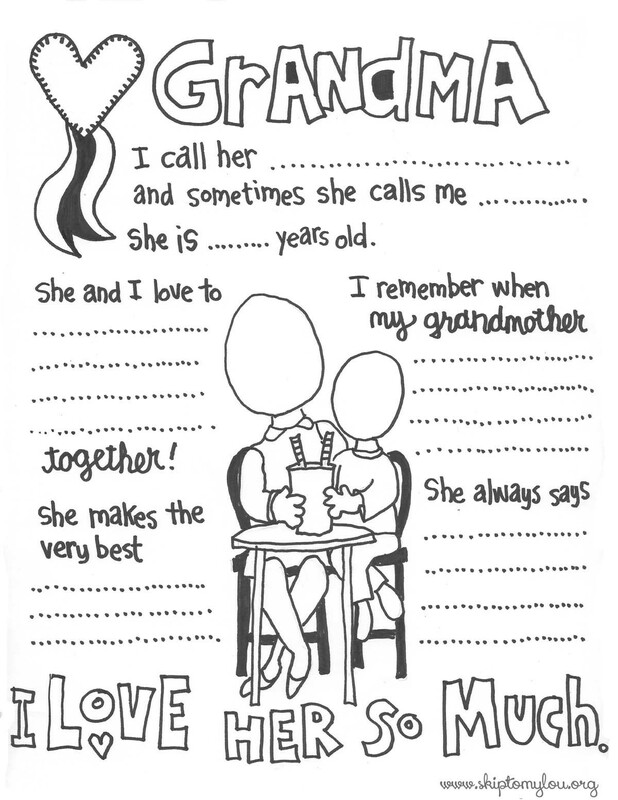 What are some of the favorite things you love about your grandmother and grandfather? 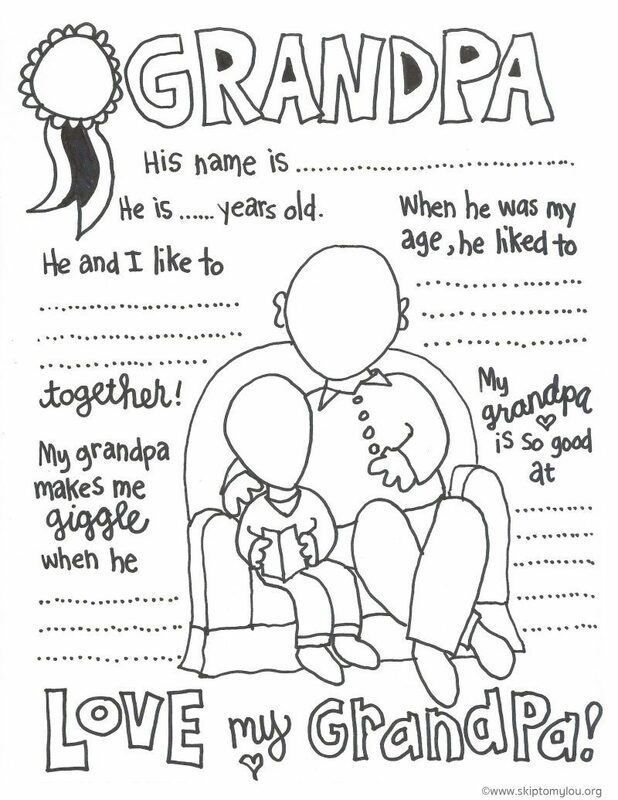 Fill out, draw your and your grandparents’ faces, and color these printable I Love Grandma and I Love Grandpa Pages. They even make nice gifts that your grandparents’ will appreciate! Math on a Sunday? You bet! Today’s holiday is about making math fun by encouraging kids to take part in competitive math-themed games with the chance to win prizes and certificates. This world-wide phenomenon plays out online too, as schools and individuals are linked across the globe. Even the youngest children are invited to participate, so why not get out those math puzzles and have some fun. You can also use math to solve some real-life puzzles today too—as you’ll see in today’s book. Grandma’s Tiny House: A Counting Story! Image copyright Priscilla Burris, 2017, text copyright JaNay Brown-Wood, 2017. Courtesy of Charlesbridge Publishing. But the tiniest girl has a big idea and whispers it into Grandma’s ear. The house may be small, but the “yard’s long and wide.” Her thought? “Why don’t we move our big dinner outside?” It’s the perfect solution, so everyone grabs a plate or a dish, the silverware, chairs, and tables and pour out the door. As evening approaches and the sun goes down, the family, friends and neighbors talk, eat, and play at Grandma’s tiny house. JaNay Brown-Wood’s joyful counting book adds up to a celebration of family and friends and offers a wonderful way to discuss math concepts, such as counting, amount, and spatial awareness, with little ones. Brown-Wood’s vivacious rhymes and dynamic vocabulary create a lively read-aloud that organically incorporates counting from one to fifteen into a larger story about the pleasures of boisterous gatherings and the love of extended families. Priscilla Burris’s vibrant and animated illustrations will put a smile on little ones’ faces from the first page to the last. As the smiling Grandma gazes out the window of her tiny home, she’s not only waiting for her guests to arrive but is inviting readers to join in too. The two-page spread of family photos gives kids an inkling of the party to come, and as each laughing, talking, waving group arrives at Grandma’s, the excitement of the day—and the enticement to count, count, count—begins. Each of Burris’s many characters displays unique personality traits as they talk, sing, high-five, run, shout, and rejoice. The people and objects to count are presented clearly, allowing children to easily find them. As the group gathers together inside the house and out in the yard, readers will no doubt want to count them all, letting them see addition at work. Each spread also offers a game of hide-and-seek with Grandma’s puppy and kitten. Grandma’s Tiny House: A Counting Story is the kind of picture book that will get kids excited about math and their own place within a family. It would make a wonderful gift and addition to home as well as classroom libraries. Discover more about JaNay Brown-Wood and her books and find resources for adults on her website. View a portfolio of illustrations, drawings, and books by Priscilla Burris on her website. You’re all invited to Grandma’s Tiny House book trailer! There’s no mystery to how fun math can be! 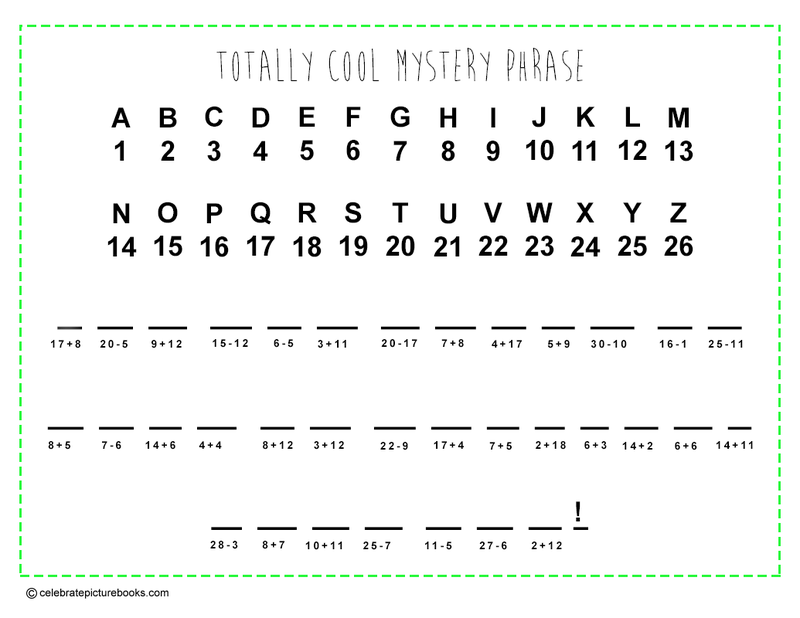 Use the numerical clues in this printable Totally Cool Mystery Phrase Math Puzzle to discover a hidden message! Add the numbers under each line then use that number to find the corresponding letter of the alphabet. Write that letter in the space. Continue until the entire phrase is completed. With their little pink noses, long ears, and soft fur, rabbits make your heart melt. Today’s holiday was established to promote the protection and care of rabbits—both domestic and wild. Found in almost all types of environments—with more than one half of their total population living in North America—rabbits need protection from habitat destruction and predators. They are also a popular gift in spring, and families are encouraged to learn all about their needs and behaviors to determine if a rabbit is the best fit for the household. 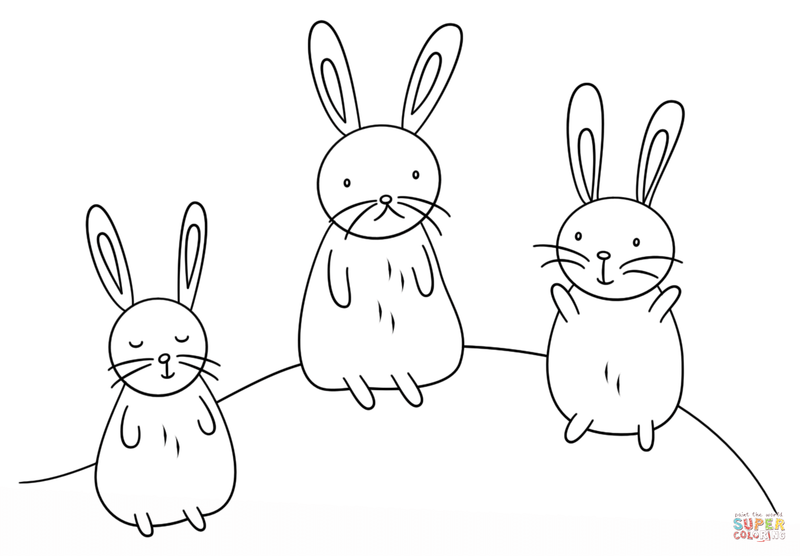 Because of their sweet, innocent nature, bunnies are often featured in children’s books. To celebrate the holiday, read a few of your favorites—including today’s book! Once King of the Plains, Old Lion had given up his place in the herd to his sons and now lived a quiet life alone. One day while napping, he felt a tickle in his mane and smelled a tantalizing aroma nearby. Old Lion discovered a tiny baby rabbit sleeping peacefully in the soft fur of his mane. “‘Hey,’ Old Lion thought, ‘this little one won’t fill my belly. But if I let him eat enough, he’ll grow up to be big and delicious!’” So Old Lion gathered as much grass as he could and fed the baby rabbit well, all the while feeling hunger growing in his stomach. Copyright Keiko Kaichi, 2017, courtesy of minedition. Now that Little Rabbit was growing bigger, he sometimes hopped far into the field, exploring just for fun. Then Old Lion worried that he might not come back, fearful that all his time and hard work would be wasted. He would call after Little Rabbit, reminding him to come back, and Little Rabbit always did. Old Lion walked and walked to the edge of the savanna, where bushes and tall grasses blossomed. He set Little Rabbit down gently and nudged him forward. “You’ll be safe” there, Old Lion told him. “You’ll find other rabbits there—maybe even your family.” Little Rabbit gazed at Old Lion sadly, but the lion reassured him that it was time to go home. Old Lion watched Little Rabbit bound away and “felt a tickle on his face as a tear ran down his cheek.” Then he turned and walked back to where his throne waited. Keiko Kaichi’s books masterfully tug at readers’ heartstrings with poignant stories populated with adorable characters that immediately inspire love and empathy. In The Old Lion and the Little Rabbit, the lion’s history is revealed naturally and at a pace that makes his transformation believable and all the more emotional. Just as do children within a family, Little Rabbit alters Old Lion’s life simply through trust and dependence. Children will respond to the growing love between Old Lion and Little Rabbit. They will also find the solution to the mystery established at the beginning both surprising and satisfying. Adult readers cannot be faulted for feeling a small lump in their throat when Old Lion unselfishly protects Little Rabbit from Hyena and then takes him to safety. Kaichi’s acrylic and pencil drawings are both evocative of the golden savanna and filled with tender sentiments. Old Lion may once have been a fierce predator, but he is now a contemplative and caring elder statesman while Little Rabbit is a wee nubbin of cuteness. As he sits next to the much bigger lion, his tiny paw touching Old Lion’s arm, or collects a bouquet of weeds under Old Lion’s watchful gaze, Little Rabbit swells readers hearts. Superb in every way, The Old Lion and the Little Rabbit would make a wonderful choice for home bookshelves as well as for public and school libraries. Bunnies are such loveable little creatures that you just can’t help but say “Awwww!” when you see one. 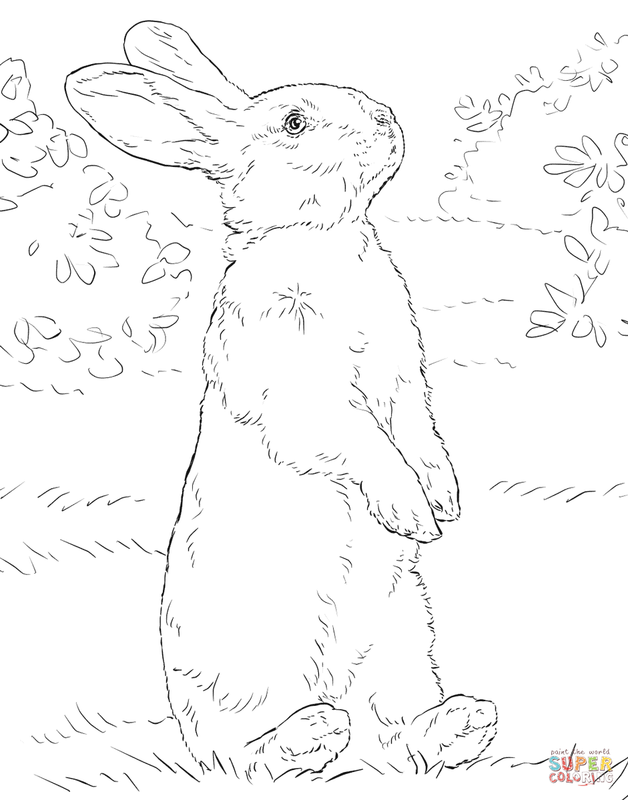 Here are two printable Adorable Bunnies Coloring Pages for you to enjoy! Classical music has been an inspiration since the earliest instruments were created. The talent and imagination of great composers of the past has been passed down from generation to generation of music lovers, influencing new music all along the journey. To celebrate this month’s holiday, take in a classical music concert or performance or listen to your favorite (or a new) classical music station. If you’ve always wanted to learn to play the piano, violin, or other instrument, take the opportunity this month to sign up for lessons! When Hana Hashimoto told her brothers that she had signed up to play her violin in the talent show, they laughed. “‘That’s just loopy,’” Kenji said, and Koji added ‘‘You can barely play a note.’” They reminded her that it was a talent show and that she was just a beginner. But Hana didn’t listen. “It was true that she was still a beginner. She had only been to three lessons.” But playing the violin was in her blood. Her grandfather, Ojiichan, had once been Second Violin in a symphony orchestra in Kyoto, Japan and had even played for the Imperial Family. Image copyright Qin Leng, 2014, text copyright Chieri Uegaki, 2014. Courtesy of Kids Can Press. On the night of the talent show, Hana waited backstage for her turn “with a walloping heart.” Five other violinists had already gone before her. Finally, she heard her name. As she strode across the stage as wide as a desert, she had a fleeting feeling that her brothers had been right—that her performance was going to be a disaster. But when she reached her spot near the microphone and gazed out at the audience, she saw her best friend and her parents smiling at her. Hana took a deep breath and let it out. Suddenly, “everyone seemed to disappear beyond the light shining down on her like a moonbeam” and she remembered her grandfather’s words: “‘Gambarunoyo, Hana-chan.’ Do your best.” Hana told the audience, “‘This is the sound of a mother crow calling her chicks.’” She “played three raw, squawky notes.” Then she played the yowl of her neighbor’s cat at night and the plucky droplets of rain on a paper umbrella. Hana played a world of special sounds, from buzzing bees to squeaking mice to croaking frogs. When she had finished, she said, “‘And that is how I play the violin.’” Then she took a bow. Chieri Uegaki’s gorgeously told story of a little girl’s first performance with her new violin rings true on every page, from her being inspired by her grandfather to her own inspirational performance. Uegaki’s descriptions of the melodies that capture Hana’s heart are as beautiful as the music itself and are a joy to read. Hana’s continued self-confidence in the face of her brothers’ teasing and her own fear is a wonderful lesson for all children. The brothers’ support of Hana after the talent show is a welcome show of familial love, and the touching ending offers encouragement and happiness. Young readers will love Qin Leng’s evocative illustrations that follow Hana on her musical journey. Notes from the violin pieces Hana admires float from page to page—from her grandfather’s home in Japan to her own room—tying together not only Hana’s fondness for the violin but her love for her grandfather. Beautiful touches, such as an image of Hana reflected in a pastel blue rain puddle and a night sky twinkling with fireflies, mirror the wonder of childhood, when everything is new and possible. Hana Hashimoto, Sixth Violin is refreshing encouragement for any child engaging in new experiences or activities. The book’s warmth and inventiveness make it a wonderful gift or addition to home libraries. Enjoy this Hana Hashimoto, Sixth Violin book trailer! These two kids are performing a duet! 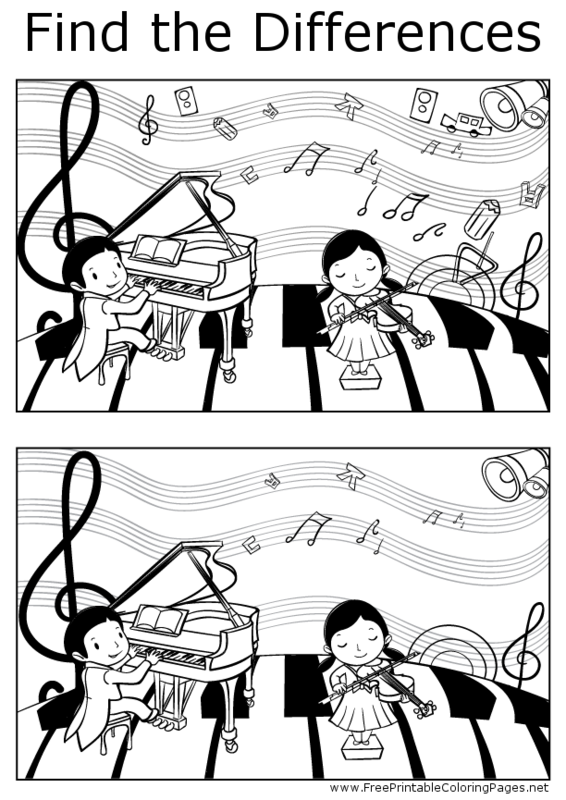 Can you find all of the differences in the second picture on this printable Musical Kids Find the Differences?